Lawns are a major player in our ecosystem. When properly proportioned and sustainably managed, they can be one of the most environmentally beneficial elements in an urban development. Grass filters the air, protects the groundwater, stabilizes the soil, reduces noise, and provides significant heat reduction to the homes nearby. The California Energy Commission has found that the evaporative cooling effect of an average size lawn is to equal about 9 tons of air conditioning. (The average AC unit has a 3 to 4 ton capacity.) This evaporative cooling helps to mitigate the urban heat island effect and and reduce heat-related illnesses. Kentfield Commons benefits from both the smaller eco-friendly front yards that are often featured as an environmentally conscious choice in newer developments, and the large mature trees that can only be found in older developments. While considerably smaller than the average front yard, our small shared lawns still provide the neighborhood with the benefits of natural grass . The average shared front yard is about 1000 square feet in total (500 square feet per home). Homeowners who would like to invest in upgrading their lawns with new sod can install standard sod or Native California sod. Transitioning from standard sod to Native California sod is the easiest way to incorporate native drought tolerant plants in the landscape, as it does not require a new landscape design or significant adjustments to the existing lawn and planting bed irrigation systems. Our landscapers are experienced in maintaining both of these types of grasses. Just note your choice in your Landscape Change Request. Please note that shared front yards must be renovated as a whole. If you'd like to replace the sod on a shared front yard, you and your neighbor must agree to replace the whole lawn at the same time using the same type of sod. Kentucky Bluegrass assures better density and faster wear recovery. California Native Sods are ecologically friendly sod mixes that have been specifically chosen for their drought tolerant attributes. They have evolved to live within California’s diverse Mediterranean climate and varying soil types. California native sod requires less fertilizer, less pesticides, and 50% less water than standard sod. Once fully established, water seeking roots can often reach a depth of 48 inches making the sod more drought tolerant and giving it superior overall resilience. Irrigation studies show that native sod thrives under moderate to severe drought stress, and can survive summers without any irrigation if necessary. 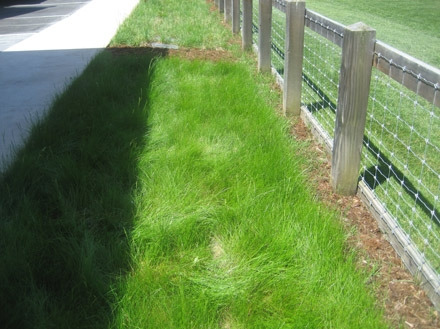 The HOA approved the use of native sod in 2014. Homeowners can choose between these two California Native Sod mixes. A low maintenance compliment to natural landscapes. This versatile grass can be maintained as a turf lawn or left unmowed. Contains two native fine fescues and one highly naturalized variety. Excellent shade and cold tolerance. Deep green glossy leaves. Slow growing, narrow leafed grass with blades that are very lax and flexuous. 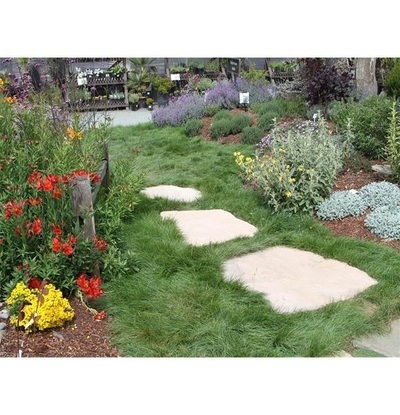 Provides soil stabilization for sloped areas. 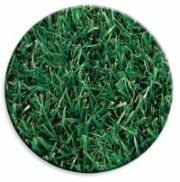 A premium soft grass with botanical emerald green color. Provides a unique contrast when planted in ornamental settings. Narrow fine leafed texture. Moderate wear resistance. Slow growing, tuft forming, clumping grass. Persists under drought conditions. Prefers to grow in partial shade and tolerates full sun. Please note that while native California sod is a good choice for many front yards and other ornamental areas, it is not a good choice for high traffic areas such as playing fields and areas with a lot of human and/or pet traffic.